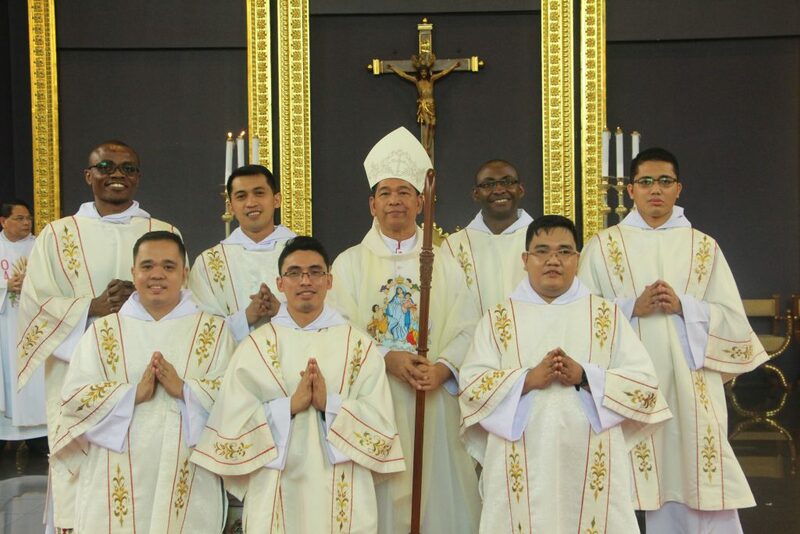 Mira-Nila Homes, QUEZON CITY—Seven Augustinian Recollect friars of the Province of St. Ezekiel Moreno were ordained as deacons through the imposition of hands by Most Rev. Nolly Buco, JCD, DD, auxiliary bishop of the Diocese of Antipolo. This momentous event took place on November 17, 2018, Feast of Nuestra Señora de la Salud, at Our Lady of Consolation Parish church, Quezon City. 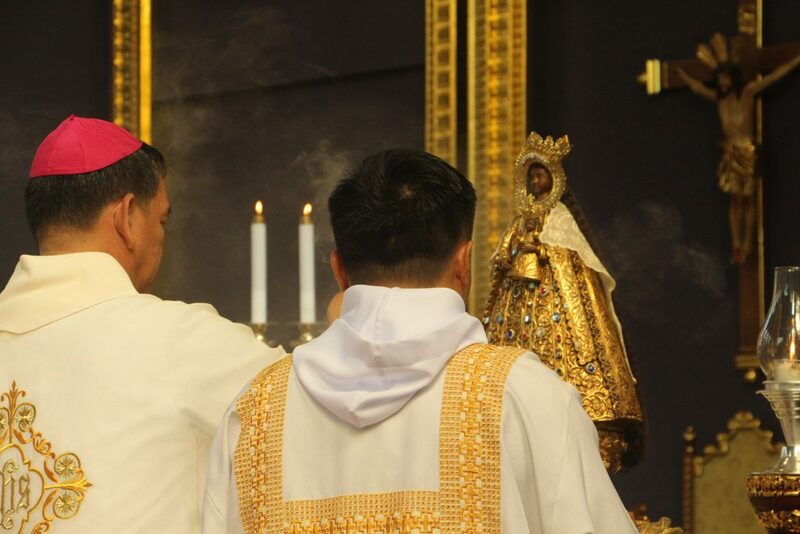 November 17, 2018 was also the Feast of Nuestra Señora de la Salud. Of this group of friars, five were sent to Spain to participate in the common Month of Preparation proximate to their Solemn Profession. They were Frays Rabacal, Gallego, Pugate, Yamaguchi, and Marcha. The two Nigerians, Frays Edobor and Omem, also belong to this group and made their Month of Preparation in Baguio. These seven Recollects were the first ordinandi of Bishop Nolly Buco, DD, who has just received his Episcopal Consecration last September 8, 2018. During the Litany of the Saints. Bishop Nolly also reminded the ordinandi of the ministries and roles of deacons that they may be “effective in action,” that is, “effective in ministry…gentle in ministry, and constant in prayer.” He even shared his experience as a deacon and recalled the moments when he was troubled. “Every time you feel so lonely and afraid, talk to Jesus, talk to Mary,” said Bishop Nolly. 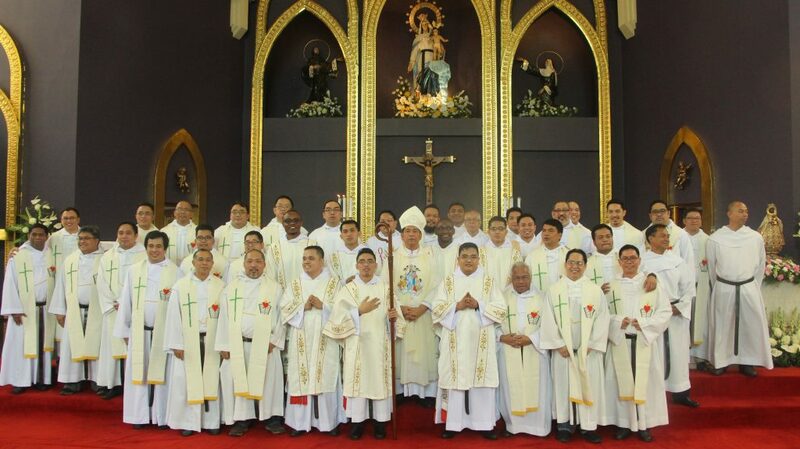 More than 30 Augustinian Recollect priests and diocesan priests concelebrated with the ordaining prelate. The Augustinian Recollect Sisters, Secular Augustinian Recollect Fraternity, Recollect Augustinian Youth, and members of the Sisters of Mary and their scholars were also present. Also, the families, friends, relatives, and other guests of the ordinandi graced the event. The newly ordained deacons with their ordaining prelate, Most Rev. Nolly Buco, JCD, DD, and the concelebrating priests and Augustinian Recollect religious.